Everyone may come in before & after school, & at Morning Break (before 10.50); but to come into the library at lunchtimes, pupils in Year 7-11 must apply for a library pass for the year. 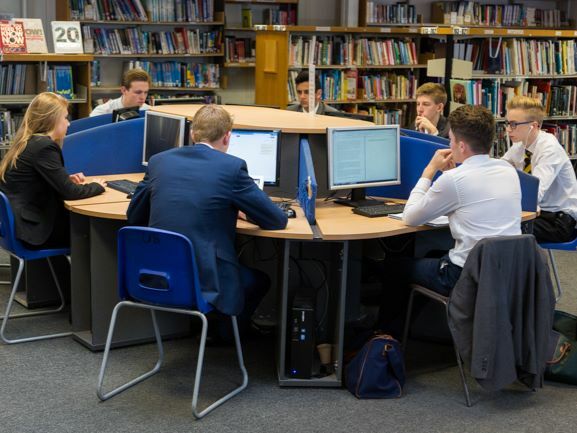 Students must arrive before 1.30 p.m. Students in year 12 & 13 do not need a pass, but must ensure that they use the library for reading or working. Fiction is divided into Children’s Fiction (more suitable for Lower School), Young Adult & Adult. All sections are arranged first by genre (such as Horror Fiction) and then arranged alphabetically by the author’s surname. We also have magazines. The most recent will be displayed on the magazine stand. The older magazines are kept in boxes on the trolley. Magazines are not to be taken out of the library. We have the Times newspaper every school day, & the local papers every week. Non-fiction books are arranged by subject; each topic has a number code (called the Dewey number). You can use the catalogue to find non-fiction books. Click on the “mls library” icon on the Student Gateway in school or out of school, & log in with your normal school log-in. Useful websites are also catalogued by subject - you can click on the URL to go straight to the site. This contains useful books about careers, higher & further education, including prospectuses. Most items are to be consulted within the library. Resources on life skills, study skills, health matters, relationships, family, growing up & social issues are kept here. Many of these are available to be borrowed. There is a section of specialist dictionaries & encyclopaedias arranged by Dewey order - these must not be taken out of the library. We subscribe to Wheelers audiobook collection. Click on the blue & white “elibrary” icon on the Student Gateway in school or out of school. There are instructions & links for downloading the e platform app so you can listen on your phone or tablet. You can borrow 2 audiobooks for a period of 2 weeks, but you can renew them. You will receive an email warning you that your loan is about to expire. Computers are available before and after school without booking, but you will need a pass for lunch time use. 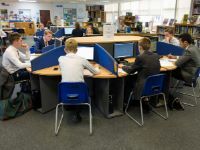 We operate a waiting list for those students still needing to use computers when all are in use. TBSHS subscribes to some online databases; ask the Librarian for passwords. 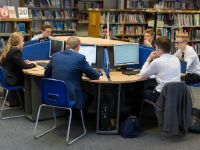 We also recommend that you belong to both Essex and Hertfordshire Public Libraries to be able to access their online resources (you need to type in the membership number on their library cards). If you want to take a book out, take it to the Issue Desk. Once you’ve taken the book out, you must return it or renew it within three weeks. If the book you wish to take out is currently out to someone else you can reserve the book. To do this you need to go to the Issue Desk and fill in a reservation card. Once the book becomes available you will be notified and it will be held for you for one week. You must return a book on or before the date shown in the front of the book. To return a book simply hand it in to the Issue Desk, and wait while it is returned on the issue system. If you haven’t finished reading/using the book, you can renew the book for a further three weeks. However if someone has reserved the same book you can only renew it once. As many people like to have a proper look at any new books, we are now putting these on a new display stand near the Issue Desk. You may borrow any new books from here straightaway without needing to reserve them. If you would like to recommend a good book for the Librarian to consider buying for the library, please fill out a recommendation slip, available at the Issue Desk. The library sells items such as pens, pencils, rulers, paper and maths equipment. There is a price list displayed within the library. In addition to the Librarian, there are voluntary helpers, both students & parents, who help with the day-to-day running of the library. Please ask the Librarian if you are interested. Phones should stay in pockets!